Oh soup, what’s for dinner?! If you’re looking for a quick and healthy dinner recipe, this is it! It won’t mess up your newly set resolutions and it will use up any leftover turkey from Christmas dinner. And it’s delicious. It’s Turkey Noodle Soup in UNDER 30 minutes! Yep, you read that right. Dinner in under 30 minutes – and we’re including cook time there. This recipe is a perfect go-to for busy families and leftover nights! Ready to get your soup on? Let’s do this! A quick, delicious and healthy soup the whole family will enjoy. Add the broth to a large pot on medium-high on the stove. Add any additional seasonings you might want. I added a tsp of garlic because we love us some garlic. When the broth warms and starts to simmer add your noodles, mixed vegetables and the turkey meat. Cover and simmer for 7-9 minutes or cook for the duration directed on the pasta packaging. Your soup is ready when the noodles are tender. You could substitute the turkey with chicken dices or pre-cooked hamburger meat. Or omit it entirely. If you use raw meat dices instead of pre-cooked, add them when you put in the pasta. Ensure they cook thoroughly. The hardest part of this meal is cutting up the turkey. Really. Everything else is just throw in a pot and turn on the stove. Stir it every once in a while and you’ll have a delicious dinner ready in less than 30 minutes. My kids loved it. And it was even finger-food-friendly for the baby – I just drained the juice off and he went to town. 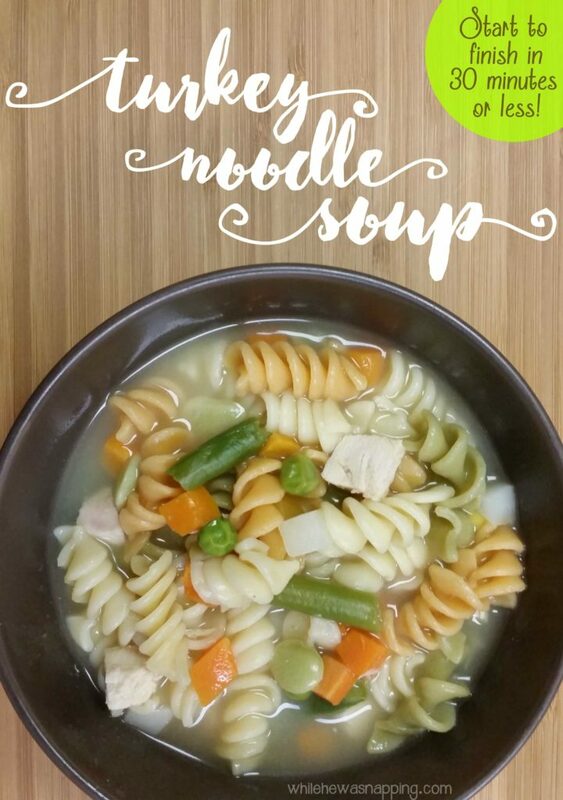 I love that our Turkey Noodle Soup was delicious, super fast, healthy (under 500 calories) and that my whole family enjoyed it! What a great go-to for a weeknight soup! This looks yummy! Thank you, Kathryn! I love how easy it is to make! Thanks for visiting!